Order Your Own Book Now! 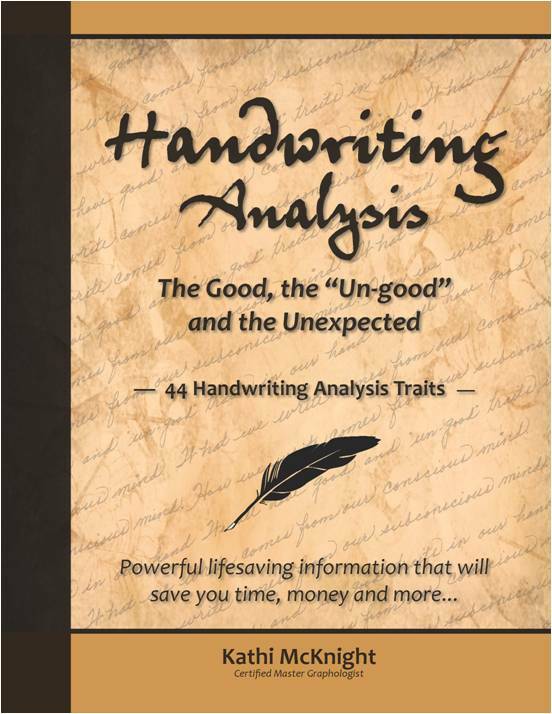 Handwriting Analysis: The Good, the “Un-Good” and the Unexpected is a delightful, concise, informative book that is a self-help manual all in one! Get ready to look at handwriting in a whole new light and learn surprising information each letter reveals. Use as a quick and easy reference guide to glean insights into friends and family you never would have suspected. The book has large print, is very simple yet so instructive. A fun way to look into handwriting analysis. On the bottom of each page is a quote or word of wisdom to remind us that our inner self-reflects outward through our handwriting. Each quote drives home the lesson the letter on that page is teaching. Don’t miss the additional links at the bottom of the pages that take the reader to enriching short additional videos and information that drive home the meaning of that page. Each page has a specially designated space with instructions to practice writing that trait to drive the learning home a little deeper. So it doubles as a little workbook, too. Its charm is its simplicity. It will whet the appetite of the beginner with a generous sampling into 44 traits – even the seasoned graphologist may learn a thing or 2. + $2.50 S&H in U.S. International shipping rates apply.